Cement is most recognized construction material. It is very useful for concrete, mortar, plaster, etc. Prior to apply cement for concrete construction, the quality of the cement should be checked thoroughly. Soundness of cement is one of such vital properties that should be examined properly prior to construction or else the cracks may develop in concrete and its durability will also be reduced. Given below, the details on the soundness of cement. The properties of hardened concrete or mortar are mainly affected by the different properties of cement. Usually, once the concrete or mortar becomes solidified, they do not set out under expansion or contraction. i.e. the volume of concrete or mortar remains unchanged, as soon as they are set. Soundness of cement means the strength of cement to maintain its volume as soon as it is solidified. Once the cement mortar or concrete gets dried, there should not be any alteration in volume. If any alteration in the volume occurs, it will allow the cement to inflate or contract. So, the cracks may form. Such cement is known as unsound cement. If unsound cement is applied in the construction work, the stability of the structures is significantly affected. On the other hand, as soon as sound cement is set, no alternation in volume occurs. Besides, once the sound cement is solidified, no expansion or contraction happens. 01. Surplus Lime: With the existence of extra lime (CaO) in the cement, soundness of cement is impacted. This extra lime hydrates gradually and develops slaked lime that absorbs a bigger volume as compared to the original free calcium oxide. 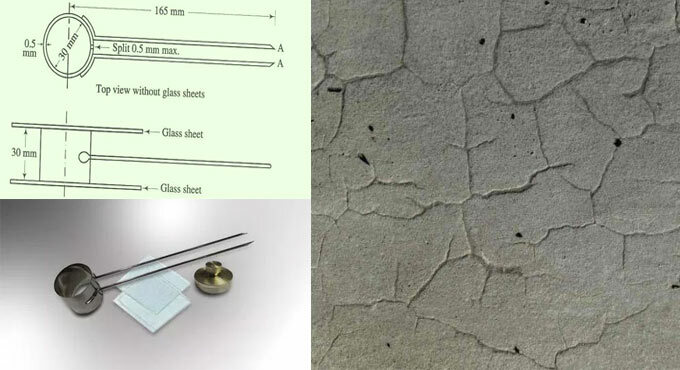 Due to the slow hydration process, the properties of hardened concrete are changed. The variation in the rate of hydration of free lime and slaked lime results in modifying the volume of hardened concrete. The cement that shows this type of volume changes is known as unsound cement. So, a limit is set in the ordinary Portland cement concerning the existence of free lime & magnesia in cement content. 02. Surplus Magnesia: Cement can also be unsound because of the existence of magnesium oxide (MgO), that reacts with water in a manner identical to the lime and influences the rate of hydration. 03. Insufficient Burning: While the manufacturing process of cement is going on, raw materials are supplied into the kiln. Different types of raw materials like lime (Cao) and some acidic oxide get amalgamated inside the kiln. If the burning and cooling processes are not performed in a proper manner, then surplus lime will stay in a free condition. Therefore, it will produce the unsound cement further. 04. Surplus Calcium Sulphate: The expansion is caused by the third compound alias calcium sulphate (CaSo4). Gypsum is included to cement clinker to resist flash setting of cement. But if excessive gypsum exists it will create reaction with C3A throughout setting and develops calcium sulfoaluminate. This sulfoaluminate creates expansion in hardened concrete. Due to this, the standards limit the amount of gypsum to be included to clinker. The limits are settled in such a manner that the soundness of cement is retained and it does not become unsound. The soundness of cement should be examined prior to utilize cement in construction. In Indian standards, the soundness of cement is examined through Le Chatelier apparatus test. The manufacturers of cement should also perform the quality control, in order to develop sound cement. If unsound cement is applied for building up your house, the setting time of cement is raised. Under such situation, if formwork is detached before time, the cracks may develop in due course of time. Consequently, the soundness of cement should be examined prior to utilize it in developing concrete.